A summer festival to celebrate all that’s great about Todmorden, bring people in, boost business and unite the town six months after the floods was a resounding success, organisers say. The Todmorden Town Festival was quickly planned after Todmorden Agricultural Show, one of the biggest events in the town’s social calendar, was cancelled. Fearing this would be another blow to the town, Todmorden town councillor Steph Booth (Lab, Central) put the wheels in motion to organise an event for the same day, saying Todmorden “wouldn’t be whammied twice in one year”. The festival, held on Saturday, included much of the town centre. There was stalls and activities on Pollination Street, arts and crafts, live music, an art exhibition and an evening concert at Todmorden Town Hall with The Ligeti Quartet. Councillor Booth, who was the Mayor of Todmorden 2015/16, said: “It was great, it really was absolutely wonderful. “The town was full and money was going into local businesses, so it was a really positive day. “We have been asked to do it again next year,” added Coun Booth. We love to hear about the events you are planning in the community. Tell us all about it. 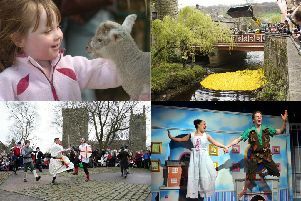 You can share your stories and photographs with us via email at todnews@todmordennews.co.uk/hbtimes@hebdenbridgetimes.co.uk or find us on Twitter - @TodmordenNews or @HebdenBRTimes.